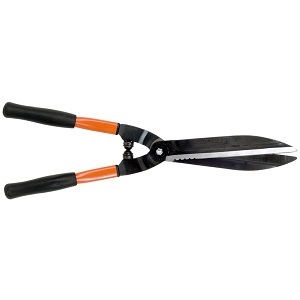 Hedge shears are a must-have for any passionate gardener or someone looking to keep their property in top condition. But there are many to choose from! What you need are the best hedge shear reviews that the internet can offer and we give you just that. After over 80 hours of close comparisons, we have created the largest hedge shear review article anywhere. 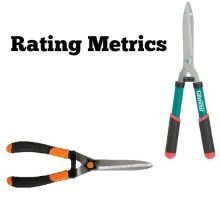 The metrics we judge by are Hedging Ability, Durability, Styling, Cost, Product Selection, Ease of Use, and Overall Rating. We have listed our top 5 choices in the table below. To read the full reviews navigate off of the Table of Contents or browse through our helpful Table of Contents located right below it. One thing there is no shortage of is brands of hedge shears. To help you out, we have included all of them below for your convenience. Simply click on the any of names to jump down to our full review. ARS offers up a few straightforward hedge shears that focus on quality and performance over all else. They aren’t going to win any beauty contests and they don’t have the loads of features that other units have, but it is obvious that ARS instead is focusing on making a product that can do what it is intended to do: shear hedges! That being said, they do come at a high asking price. Bahco offers up one of the most diverse ranges of products, varying from things such as automotive to power drills, storage, gardening equipment, lighting, and much more. Typically, they are priced in the middle to premium price range which might initially scare some people off. However, the products that they do offers are great quality and typically come in a variety of shapes, sizes, and attributes. This is no different when discussing their hedge shears, which they offer quite a few variants of. Barnel is somewhat unique in that they have a huge selection of items that almost completely center on gardening. While there are plenty of other companies who make many products including hedge shears, very few are as focused into one niche as Barnel. Because of this, one would expect that they have a good grasp of what is necessary in order to make a viable gardening product. This is definitely the case in their wide array of hedge shears. They vary in size and shape, but many are powerful and large enough to be used in professional settings. They utilize premium metals in all their blades and also implement various other features that help to make them stand out from the competition. However, they do come at a high asking price. Black and Decker is a company that just about everybody recognizes, and for good reason. They have a huge selection of products and have established themselves as being one of the go-to companies for everything from power tools to outdoor equipment and much more. Due to their size, we are actually a little surprised that they currently only offer two types of hedge shears, and both are very similar sized. That being said, they do differ in that one is a straight edge and one is serrated. Prices are very reasonable. Centurion is one of the smaller brands that we are looking at. Their focus, while on garden tools, is somewhat small when compared to many of the big box retailers we have looked at. This is also reflective in their small product choices, with only two hedge shears being available. It appears that their plan of attack is being extremely affordable. In fact, these are some of the most affordable hedge shears you will find. But obviously, that comes at the cost of build quality and performance. Not to be confused with the popular beer, Corona is a company that offers up a huge range of products. Within their pruning tools category, they do manufacture a pretty large and diverse range of hedge shears to choose from. The blade sizes come in many lengths and construction is quite good. For this, however, they do ask a premium price. But in regards to performance and materials used, it is more than justified. Esschert Design is a really interesting company. They deal with a very eclectic mix of things from bird houses to garden tools and even nature prints. And they do so while trying to put a classy and timeless twist on the styling of it. But how does that translate to a hedge shear? Well, they only offer a single model and it is very simple in its approach. The looks are definitely there but for the relatively high asking price some may be scared from the lack of features. If you are looking for a pair of hedge shears that you will likely be the only one on your block (or neighborhood or even city for that matter) that own then you may want to consider some Faithfull hedge shears. These are premium-level hedge shears that cater to those looking for high-caliber products that can handle any job and are willing to pay a bit more for it. There are plenty of sizes and configurations to choose from. Most people recognize Fiskars for their scissors rather than their hedge shears, but that doesn’t mean that they don’t offer up some impressive examples. There are plenty of products to choose from of varying sizes and performance levels. In addition, the asking prices are more than reasonable enough for most people. Gilmour might not be a recognizable lawn care brand by most, but they do bring to the table a couple of options for hedge shears. Their main selling point is in their extremely affordable prices, but in order to achieve this, they do have to take a few shortcuts in the quality and performance department. 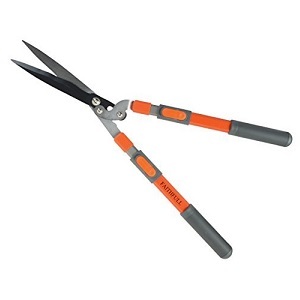 You can choose between their telescoping all-purpose shears and their basic hedge shears. We aren’t super familiar with what all H.B. Smith offers but do know that they produce two different hedge shears. There aren’t a lot of variations to the two, but both are sized at a level that allows them to be applied to a relatively wide list of tasks. They utilize high carbon steel blades but the material isn’t as high quality as some of the others on the market. This is likely attributed to its very affordable price point, though. Joseph Bentley makes very attractive and classy garden tools that are designed to perform as well as they look. While they are a bit on the expensive side, they try to offset that by making sure to only use the highest quality of materials and construction methods. Many people will see their products and consider them “old school”, as they don’t implement many of the modern and accepted ways of doing things. This is no different in their small line of hedge shears. Mintcraft focuses on budget items are also has an impressive array of accessories and replacement parts. They mostly focus on home and garden but have other products as well. Their hedge shear lineup is surprisingly big despite not doing a very good job of promoting them. Performance may be lacking some but they do offer some of the larger hedge shear sizes in the industry. Like most people, when you think of Miracle-Gro you first imagine their soils, plant food, and seeds. However, they also offer up a range of tools as well. This includes a single hedge shear. You won’t get quite the performance and features you get with larger brands that have a wider range of shears but what they do offer is serviceable and it also comes in at a very competitive price. Okatsune offers up a unique background, being based out of Japan and specializing in premium razor-sharp blades. They apply this to a wide variety of products including their relatively diverse hedge shear lineup. There are a variety of sizes and blade lengths, but beyond that, the design and features are pretty simple and straightforward. While we can’t deny the great cutting ability and build quality, it comes at a very high asking price. Scotts focuses almost completely on lawn-related products instead of garden and beyond. While they mostly have mulches, weed control, etc., they do offer a small variety of law products. Within this, they have a single example of hedge shears, the AirShoc. Prices are about average, but overall performance and durability are a bit disappointing. And we obviously have some issues with the extremely limited product options. We all typically recognize Stanley and their trademark yellow and black color schemes. However, when we ask most people about Stanley products they tend to mention their power tools. They also offer three different hedge shears. While that is a relatively small number, the three that they do offer are quite diverse. Typical to many other Stanley products, the pricing also tends to fall towards the middle of the road. Stanley hedge shears attempt to implement tons of helpful features and ergonomic accessories while still maintaining usability and a competitive price point. Tabor Tools doesn’t appear to be a very large company but they do have a quite diverse range of hedge shears. These include both wavy and straight shears and also come in sizes that are both targeted for the casual user and other that are more intended for professionals. The quality is definitely there, from the thick and oversized handles to the premium blades that rip through vegetation. And all of this comes in a price that is very competitive. True Temper does make a single example of a hedge shear but it appears that it may have been discontinued. However, it is still wildly available so we decided to check it out. True Temper is a lawn and garden specialty company that mostly focuses on hand tools. They are very affordable and attempt to compete in the budget market while offering products that are still of high enough quality. Truper is a budget-oriented company that offers quite a few different products including hedge shears. Their shears are pretty straightforward and are somewhat limited in application and selection. Specifically, they have 3 different products to choose from. All three look quite similar and have very standard levels of performance. Worth Garden has products related to gardening, watering, power tools, and growing. In regards to their hedge shears, you have multiple options in 8” and 10” blades as well as topiary hedge shears. There is also variety in that you can choose between both straight and wavy blades. Prices are very reasonable but in order to get to this price point, you will have to deal with a bit lower quality and performance. There are a lot of factors one should consider when trying to determine what the best hedge shears are. We break down each of the metrics that we use below. Arguably the most important factor, this metric encompasses the overall performance of the hedge shears when it comes to its purpose: hedging! We consider how easily the hedge shears can go through foliage and also how thick of stems and vegetation it can handle. This is primarily governed by two factors: the quality and sharpness of the blade and also how long the handles are. longer handles mean that you can get a stronger bite with each pass. Also related is the overall blade size. A large blade means that you can cover larger amounts of area which directly affects how long a particular project will take you to complete. Build quality is also very important when shopping around. You want a product that will last for many years and be able to stand up to the expected wear and tear of the garden or other outdoor setting. Using high-quality metals over cheaper plastics, implementing thicker handles, and using premium hardware are just a few of many factors that play a part in overall durability. While not as important to most, we do consider how attractive a pair of hedge shears look. We were surprised to learn that there is actually quite a bit of variety when it comes to hedge shear designs, with some brands doing much better than others. Things such as color schemes, how well the brand is able to implement features without making it appear to be too cluttered, and many other considerations play a part. Cost is always at the top of everyone’s list when shopping around, and for good reason. There is a rather large range in prices for hedge shears. On the low end you can get extreme budget models that are likely missing features and don’t perform as well and on the other end, you have very expensive products that are loaded with features. Now just because one particular product is more expensive than another doesn’t automatically mean that it will score lower. We look at the “big picture” and decide if the asking price is a good representation of the level of product you will be receiving. There are many applications for hedge shears ranging from small gardens up to large commercial and industrial applications. In addition, there are various types of blades including wavy and straight as well as varying handle lengths, telescoping handles, etc. We value companies that offer multiple models so that more people will find a product that works for them. It also shows us that particular brand likely knows what they are doing since they have experience with more than one model. Using hedge shears can be a tiring exercise. Blades that have a lot of friction in between them, blades that struggle with cutting, handles without impact bumpers, and many other examples can make a simple task turn into a huge headache. As such, we value hedge shears that are very user-friendly and perform with only the minimal amount of manual labor required. As the name suggests, this is the overall rating that we give a product. It considers all of the other sub-metrics mentioned above and helps us to arrive at an aggregate rating. Typically, we like to go for items that have 3 stars or more but even lower ones can be acceptable in particular scenarios. 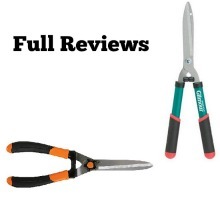 These are the full reviews we have performed for each pair of hedge shears. We break down the pros and cons of each and rate them based off of our established rating system. These blades are some of the sharpest and longest lasting on the market. This is thanks to the quality high-carbon steel that ARS uses to make the blades. In addition, they come with helpful features such as chemical nickel plating that make them last even longer. While they do last a while, it is recommended that you change out the blades on regular intervals, which is why ARS includes a spare. As for the handles, the first thing you will likely notice about them is how long they are. This allows for high levels of shearing force to be transferred into the blades, meaning that you should have no difficulty cutting through even the most challenging brush. You can expect a pair of ARS hedge shears to last for a very long time. The only plastic you will find on these is in the handle grips, and the rest of the product comes in long-lasting materials such as chrome and high-carbon steel. There aren’t as many features and moving parts in these as you will see in some of the competition, and that means that there are fewer places that could potentially break or have issues. The styling of these units is very bland. It is obvious that ARS wasn’t too concerned with making a product that will wow people with visual appeals. They are a very simple, straightforward design and only comprises of semi-glossed metal and red handles and accents. These are some of the most expensive hedge shears on the market. For those looking for a low-cost solution, you may be out of luck. However, like many things we recommend buying something that will last for much longer even if it is a bit higher of an initial asking price. These ARS hedge shears are no different. Sure, they cost a bit more up front but you can expect years of great performance with these. While they are by no means that most vast array of shears on the market, there are enough choices to make most people happy. There are a few variations blade length as well as handle length. In addition, some of the handles come in curved formats for optimal cutting angles while other come in traditional straight handles. One thing that you won’t find is wavy/serrated blades or multiple choices of handle materials like you will often find in some of the competition. Despite the thick metal frame, these are actually surprisingly lightweight. In addition, the oversized handles make it much easier to cut through thick vegetation. The curved handles were also a nice touch as it seems to be shaped in the perfect way to assist those who might have weak arm strength. However, beyond that, you won’t see a lot of the features other brands may have such as gel grips, spring-loaded handles, etc. But we don’t really see the need for it as they do a good enough job already. ARS has really impressed us with what they bring to the table in regards to their hedge shears. While they may seem bland to some, they more than make up with styling with awesome performance and razor-sharp blades that tear through vegetation. And they do all of these in a simple package that will last for years while being lightweight enough for anybody to use. You will have to pay a high initial asking price but we feel that this is more than justifiable with what you get. We really must commend Bahco as the performance here is very good. The metal that they use is extremely strong and forms a great, sharp point that rips through vegetation with ease. They also come in blade lengths that, even on the lower end, are plenty long and will remove quite a bit with each pass. For those more challenging locations, they also offer longer handles which allow you to get an even stronger bite down. They are advertised as being able to handle up to ½” thick branches on many of their product examples which we find quite impressive. These units are made to last for several years without issues. The blades that they use are fully hardened steel which shouldn’t have issues with cracking or having major rust problems like some of the cheaper brands. The handles are made of quality aluminum that is also rust-proof and strong enough for most people’s needs. They do also offer some examples that have wooden handles as well which are also plenty tough. The various components such as the screws and gaskets necessary to assemble the hedge shears are well made and will also stand up to typical wear and tear. Styling is simple but effective. Bahco has decided to stay somewhat conservative with their colors and designs, with a majority of their products being primarily black and silver with slight orange accents. There are a few that up the orange game some but it still doesn’t come off as being cheesy or cheap looking. We particularly like the subtle but noticeable curves that many of the handles and grips have, and it is something that we wish more competitors would think about doing. As mentioned above, these are not cheap products. However, they aren’t quite the most expensive you will come across, either. For the price, you get a great pair of hedge shears that should last a long time and perform up to expectations, so we feel that their asking price is more than justifiable. But it may still be too high of an asking price for some people. There is a rather diverse selection of hedge shears models to choose from. They come in both short and long examples and also offer both straight and serrated edges. In addition, they even offer up telescopic hedge shears for those who need extra reach or cutting ability for those difficult spots. There is also enough variety in the styling to make each particular unit stand out from another one, which helps to give the owner the feeling of owning a unique item. While these are tough, they are surprisingly not that heavy. This mostly can be attributed to the decision to use aluminum instead of steel or thick wood as the base. While the wood examples from Bahco will be a bit heavier, none of them are overly burdensome. The blades pass by each other with relative ease and we are happy to report that they also install bumpers on all of their blades which takes away the sudden and uncomfortable impact that can occur on your wrists when slamming the two handles together during operation. We have no real issues with Bahco hedge shears. In fact, we feel that they do everything pretty well! From their cutting performance to their product selection to toughness, Bahco shows us that they have a good understanding of what is needed in a quality set of hedge shears. Just keep in mind that if you are on a tight garden tool budget you might be a bit taken back from the price, but consider it a wise investment that will pay dividends in the long run. In regards to hedging, Barnel hedge shears are some of the best in the industry. They have a huge range of sizes, starting from the compact 5” and go all the way up to enormous 11 ¼” length. While the large sizes will be able to cut more vegetation in a given period of time, even their smaller examples perform quite well for their size. This can be attributed to the hard chrome straight or serrated blades that they come in. In addition, the handles are more than long enough and even come in different shapes so you are able to can an optimal level of leverage while using. Build quality truly shines with these products, and you can expect them to last for many years of typical abuse. We mentioned the great blades above but it goes much farther than that. The handles and body utilize drop forged aluminum which has an excellent combination of toughness while still being relatively lightweight. In fact, some of Barnel’s product even take advantage of extended aircraft aluminum alloys which really puts it in a class of its own. The rubber components used in the grips is also premium quality thermoplastic rubber that is waterproof and very tear resistant. Styling is fairly straightforward, but there is quite a bit of variety in regards to color schemes and shapes. You might have a hard time even accepting that two random Barnel hedge shears are from the same company when you lay them side by side due to how different they look. Three of their products are available in gold-colored frames with varying shades of red handles and there rest come in traditional silver with black handles. The biggest negative about Barnel’s products is their high prices. These units will definitely be situated in the premium price tier. However, they are completely justified in their asking price. The level of craftsmanship and great material selection means that these likely aren’t cheap to make. And if you are able to swing one of these you will have something that will last for a very long time and can be used in a wide variety of applications which is something a lot of the competition can’t say. There is a very nice array of products to choose from, and they vary quite a bit from one another. Barnel checks all the boxes including personal and professional-level hedge shears, straight edge and serrated, and varying blade and handle lengths. Because of this, you should have no problem finding a product that works for you. The aluminum frames are on the lighter side despite being quite strong, but due to the huge blades, the weight does go up a little bit. In their largest sizes, you may have to strain a bit more than you would like to cut but the time you save from the high performance more than makes up for it. All of Barnel’s hedge shears also come equipped with cushioned grips and rubber impact pads in between the blades that help reduce a lot of the potential strain. Barnel really knocks it out of the park with their diverse line of hedge shears. The decision to go with the highest quality materials in both their blades and handles proved to be a good choice and anybody who buys one of these items will not be disappointed. The only concern is the high initial asking price but it is well worth it. Hedging ability in both Black and Decker hedge shears is about average. While both approach shearing in a very different way (one utilizes a more direct slice via a sharp edge while the other takes advantage of a sheared edge that does more grinding) neither really stands out or fails miserably at their respected tasks. The blade material they use isn’t bad, seeing how it is quality hardened steel, but we feel that the biggest thing holding it back from being super effective is the somewhat short handle. In fact, the blades themselves are average if not above average in length, but without the long blade, it is hard to build up as much force. These take advantage of the traditional black and decker quality, which most consider quite good for the price but by no means industry-leading. The components are all of the decent caliber, but we are a bit disappointed in the handles as they have a bit more plastic than we would like to see. However, as mentioned above, the blades are of acceptable quality and should hold up to most wear and tear. While the handles of the two shears are pretty similar, the blade of the 23” actually comes in a matte black finish, which is truly a rarity for most hedge shears. This makes the product really stand out, particularly against the glossed silver screws that are used to hold the two sides in place. Fit and finish are fine, but we do wish that they decided to go with more metal in the handle as the plastic they utilize can give off a somewhat lower-caliber feel. The asking price for these units is very affordable. While it won’t be the cheapest on the market, most people will recognize the Black and Decker name and that in of itself is worth the slight upcharge. In addition, you get to enjoy the solid Black and Decker warranty and customer service in the event that there is a malfunction or issue with your hedge shear. The choices or products are very limited here, seeing how there are only two to choose from. While the two do differ quite a bit in regards to blade type (straight edge vs. serrated edge) beyond that they are quite similar in regards to size and performance. There were some smaller-sized models that Black and Decker produced in the past but for whatever reason, they decided to discontinue these. We hope that in the future Black and Decker decides to present more choices so that they hit a wider target audience. The usability of these products is about average. They won’t have the smoothest stroke but the friction isn’t overly tiring, either. Being made of a lot of plastic and having smaller handles, they do end up being somewhat on the lighter side which is nice. However, the lack of a long handle means that you may find yourself having to put a lot more force in than you want to cut through vegetation. Thankfully, they do offer impact bumpers on their 24” serrated model but no such luck on their smaller 23” straight edge model. Black and Decker hedge shears don’t bring anything groundbreaking to the table but stick to their proven method of manufacturing decent products for a reasonable price. We are a bit disappointed in the lack of selection of sizes, however. But for those looking for a standard product with a respected name at a reasonable price, you won’t be too disappointed with one of these two products. 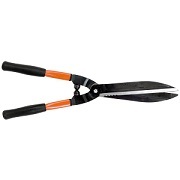 Like many other hedge shears, these utilize hardened forged carbon shears. While the blades themselves aren’t bad, they do seem to fall apart a little quicker than we would have hoped. Out of the two models to choose from, the 208 is going to typically be the better performer as it comes with longer handles and longer blades which allow for a stronger bite with each stroke. However, the blades are a bit on the thin side and can actually bend when overly stressed, leading to premature failure. Remember how we said that these are some of the most affordable hedge shears on the market? You can really tell that here. Instead of enjoying premium metal or wood handles, you are instead stuck with plastic and rubber which are prone to failure much more quickly. In fact, the blades may simply fall off due to not being well secured in their slots on the top of the handles. Also, as mentioned above, the blades can chip and bend under what we feel are normal conditions. Aesthetics are simple but do not give off the vibe of being high quality. The blades look thin and weak, particularly in the 511 model. The handles are equally puny and the yellow and black just doesn’t really work and makes the whole thing look gimmicky. All in all, we aren’t very impressed. This is easily the biggest pro of these. For those on the absolute tightest of budgets, Centurion will be something you can likely swing. For the rest of you who can spend a bit more, you will likely want to shop elsewhere where paying a bit more will go a lot farther in regards to performance and life expectancy. There are just two products, and both are somewhat similar other than the length. For such a small size selection, we wish that they would have done something more unique with one of the hedge shears such as implement wavy blades or go with a long telescoping handle. The benefit of using plastic and thin blades is that these are very lightweight and shouldn’t be much of a strain to handle or use. However, the blades have a tendency to rub together, causing friction, and it can make each pass a lot harder than you would like. We are grateful for the impact bumpers, however. We appreciate Centurion hedge shears in that they attempt to really make a statement with their low asking price. 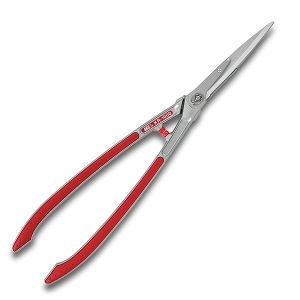 Higher quality hedge shears can be quite expensive and may be out of reach for some. However, we also feel that the shortcuts that had to be made in performance and material selection or simply too much to overlook and if you are on that tight of a budget we recommend saving up for a little longer and buying something that will make you much happier in the long run. The blades utilize high-quality steel and take advantage of forged rather than stamped steel. This results in a very straight edge that stays sharp for much longer than some of the competition out there. Shear blade sizes vary but all come with nicely-sized handles that allow for a really strong bite when you squeeze them together. Our only minor complaint is that they don’t have as many options for super thick vegetation such as stems that are an inch thicker or more. Most of their blades are on the slimmer side and may struggle with this. Build quality of these hedge shears is quite good. They utilize forged steel blades which are waterproof and should last for many years. In addition, premium materials are used to build the handles including bolted-on hardwood or aluminum. The metal is typically heat-treated which gives an extra bump in overall toughness as well. As for frame thickness, we have noticed that in most models it is plenty thick and gives off a feel of sturdiness. There have been a couple of reports of aluminum handles breaking but these are minor concerns and don’t happen often. There is quite a bit of variety in the specific layout of the handle, both in color and design. The one key similarity is the bright orange accent that is on nearly every model. That being said, none of the products stand out as being super progressive in design, but the simplicity does give off a feeling of being quality. We particularly like the feel that the wood-accented handle has as the combination of the traditionally-colored wood with the bright plastic pieces is quite intense. These are very pricey hedge shears and are among the most expensive you will find on the market. However, you are paying for quality and the established Corona tools name. The materials that they use and the features that they have means that when you purchase one of these products you are getting something that will last, but it does come with a rather high initial admission cost. There is a very nice variety of products to choose from, and they come in enough different size and feature options to make most happy. Specifically, blade length range from the small and compact 7 ½” up to the huge 10” variety. In addition, there are both straight as well as serrated blades which mean that these units are ready for a wide variety of applications. Finally, there are several choices in handle material such as traditional handles as well as handles that come with ComfortGEL technology. These products are very simple to use to use thanks to features such as ShockStop bumpers that reduce arm and shoulder fatigue and precision pivot bolts that help for silky smooth cutting action. As mentioned above, the handles are very ergonomic and come with great grips that are both comfortable as well as effective even in less than optimal environments. We love the ComfortGEL handles that are quite comfortable. The hedge shears vary some in regards to weight. It seems that the ones that have aluminum frames are quite light and nimble but the wooden ones are a bit heavier. Finally, for those who want extra strong bites with minimal effort, there are a few choices of shears with extra-long handles as well. Corona tries to compete in the premium-priced hedge shear market and overall does a fantastic job of it. There are plenty of sizes and specifications to choose from so just about everybody will find something that works for them. All of the products are well-made and are constructed with high-end materials that should handle the typical abuse one experiences while working in the garden. Looks are a bit subjective, but there is no denying the high-quality feel that these products give off. That being said, be prepared to pay a relatively high price for them. A pair of shears doesn’t get much more straightforward than this. It is essentially two stainless steel blades on a handle. You won’t find any exotic materials, wavy blade edges, or specialized handle shapes. This does impact performance and you won’t get quite the cutting ability that you do with some of the other premium-priced models on the market. However, the blades are quite large and the quality is good enough to mean that they can handle most normal tasks and the blades should last for a decent while. The best feature of a simple design is that there are fewer problems that can arise due to fewer components. In that regard, these are very tough competitors. Furthermore, you can tell that a lot of care goes into manufacturing. The wood handle might scare some off but it is very tough and comes with a coating that makes it resistant to moisture. The same can be said for the handle. And that plastic and cheap rubber components that you oftentimes see in other models are nowhere to be seen here, which is a good thing. Yes, these are very simple designs but they look classy. The wood and metal are polished in a way that makes these almost too nice to use out in the garden. You won’t find any bright colors or patterns on these. Rather, Esschert Design lets to glossy wood and polished steel do all the talking. From a price standpoint, these will be relatively expensive. This might scare some people off, particularly after seeing that you really don’t get to enjoy many features with these. But for the features that they do have, you can tell that they only used the best which is likely why others will feel that the asking price is warranted. We are a bit disappointed there is only one pair of Esschert Design hedge shears to choose from. That means that there are no additional size options, blade shapes or sizes, or features such as telescoping handles. This really dilutes down the target audience that this company can advertise towards. These definitely aren’t the most user-friendly hedge shears you will ever experience. The lack of rubber grips is definitely noticeable here and it makes gripping them in wet conditions a bit of a challenge. In addition, not having a rubber bumper means that every time you slam the blades closed, a lot of the impact will go through your wrists which may become uncomfortable after a while. We love the styling and the classy feel that these Esschert Design hedge shears give off, and the overall performance isn’t terrible. The materials that are used at top-notch and should last for a long time despite not implementing a traditional metal handle. However, the lack of wanted features might make these too barbaric for some people who prefer more modern advantages such as impact bumpers. We also wish there were more sizes to choose from. We really respect how effective Faithfull hedge shears are at doing their job. This is thanks to multiple components. First, their blades are excellent quality and made of effective carbon steel. Second, these blades are quite thick and burly and can handle the wear and tear you will put on them while keeping a sharp point for a long time. They also come in both straight blades as well as wavy blades configurations. Finally, these products have some of the longest handles in the industry. This means that you get a ton of power behind each cut and can rip through even the most challenging vegetation and limbs. These products are designed to last. As mentioned earlier, the blades are of great quality and can handle plenty of use. In addition, the shafts are made either carbon or lightweight aluminum tube. Both of these (particularly the carbon) have great material specifications and can handle plenty of stress (including slight bending) without cracking or breaking. As for the other components, they are equally of high quality and should last for a while. The designs are simple, yet effective. They come in two color options. For the lower-end models, they come in a yellow and black color palette with alternative yellow/black patterns on the handles. For the higher end (called the Samurai line), they switch to a slightly different pattern and replace the yellow and black with orange and gray. In addition, the shafts on the Samurai line give off the appearance of being much thicker which adds to the tough look. Brace yourself. These will be among the most expensive hedge shears on the market. We understand that the sticker shock might scare some people off, and other people simply won’t have conditions that require such a high-performing set of hedge shears. However, for those in industrial or commercial applications or that have very large gardens, the extra price of admission might be worth it. We can definitely appreciate the large product range here. 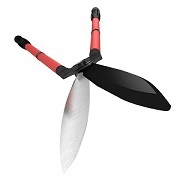 There are two entirely different product lines with their own unique selling points and within each line, there is a variety of blade lengths, blade shapes, and they even have telescopic models in both lawn and edging formats. The only thing that is really missing is a low-cost option. Ease of use is great, particularly in the Samurai lines. Things aren’t quite as convenient in the lower-end models but they are by no means bad. You get to enjoy geared action which makes it much easier to cut and release. Furthermore, the blades are coating with a unique coating that creates a very low coefficient of friction and makes it easy to slide the blades across one another. Other helpful features include comfortable padded grips as well as rubber bumpers in between the handles. From a performance standpoint, Faithfull hedge shears truly shine. This is especially true in their upper-end Samurai models. The blades they use are thick and strong and the handles are equally impressive. There are also plenty of sizes and blade configurations to choose from. But they are very expensive and may very well be out of the reach for some people. The shearing ability of these products is more than adequate, particularly in their Power Lever and Quantum models. There is a large enough handle to provide some good torque, which will help you cut through relatively thick vegetation. You will notice a bit of difference between the metal used for blades in their lower-end and higher-end models, but all do a good enough job to make most happy. Cutting range is also quite wide and some might feel that the smaller sizes require too many passes but the larger shears are large and can cut impressive areas. Durability is quite good across the board and really shines in the top models. The budget offerings will have a bit more plastic than some might like, and a couple of the smaller Power Lever models have had some issues with the back pins falling out after a short period of time, which essentially makes the shears inoperable. But these issues are not super common and shouldn’t affect too many people. For those who are willing to spend a bit extra, you give up a lot of the plastic and instead get to enjoy premium metal components that should last for many years. These products look very nice and resemble the standard Fiskars designs that you are used to seeing in their traditional scissors. They come in black and orange-accented handles with semi-glossed steel blades. In their higher-end models, you will also find more contours and noticeable performance features on the blade mechanism that really gives off a look of quality. Prices are quite varied with Fiskars hedge shears. On the lower end, you have several choices that are very reasonably priced and should be within everyone’s budget. On their upper end, you have much more expensive models that justify their high asking price with usage of premium materials, larger blades, and overall better construction and ultimately performance. 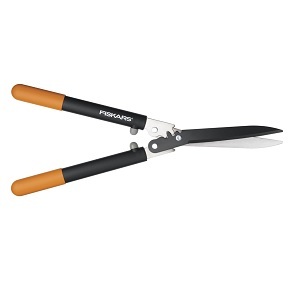 Fiskars has one of the largest ranges of hedge shears to choose from on the market. They have a nice range of blade sizes (from 18” to 25”) that also include wavy blades. In addition, there are a variety of handle layouts including softgrips, extended handles, and more. No matter what your hand size or budget is, you will likely find something that works for you. These units are very easy to use. They are relatively lightweight which means that you won’t struggle when you try to hold them out. In addition, the handles are designed to be very easy to operate. This is thanks to features such as compound lever technology, low-friction blade coatings, and even patented gearing technology. We also like how easy the grips are to hold on to in the SoftGrip models. And for those who are trying to get to hard to reach places, they have extendable handles that can access areas much farther away. We are really impressed with what Fiskars brings to the table with their diverse range of hedge shears. There are plenty of products to choose from, and asking prices on the low end are very reasonable. On the higher end, you get to enjoy many unique and propriety features that you will only find on Fiskars. This results in great-performing units that should be able to handle most hedges. And overall durability is more than adequate other than the occasional issue on their budget models. The performance of these products is a bit lacking. While they utilize steel blades, the steel that they use isn’t as high quality as many other products on the market and will not only struggle to cut through thick foliage but will also lose its sharp edge relatively quickly. 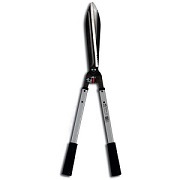 The telescoping model has relatively long handles which help in creating a stronger bite, but their basic shears have a very short handle which means that everything but the softest growth might be too much to handle for them. There are several questionable quality issues with these units. The metal is not coated in any sort of anti-corrosion film so after a short period of time, they are prone to rust, particularly if they are exposed to wet environments that can be common in vegetation areas. Also, as mentioned above, the blades don’t stay sharp for long so you will have to put forth more maintenance than you may like in keeping them operable. The frame itself is well put together, however, so you don’t have to worry about the handle falling apart. These are very straightforward in styling. The blade is actually a lighter colored silver than many other blades on the market. The handles come in a rather unique green/red/black color scheme that is a bit too 1980s for us but it definitely stands out. Our biggest complaint is with the fastener that holds the two pieces together located on the blade. While it does its job, it just looks cheap and gimmicky and doesn’t give off the feel of being high quality. 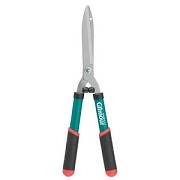 One of the biggest selling points of the Gilmour hedge shears is their great price. Both of their offerings are extremely affordable, with their basic hedges being one of the cheapest on the market. Despite their issues in performance mentioned above, the great asking price more than makes up for it and just about everybody would agree that it does its job when looking at the low entry price. We do have some issue in that there are only two products to choose from, and both are targeted towards lighter foliage. Anybody looking for a more powerful unit that can handle thicker brush will be out of luck. There is also one blade type and the handles, while varying in length, don’t vary much in regards to structure or design. The combination of relatively thin metal and light plastic means that these are quite light and easy to handle. However, they won’t have the smooth stroke that higher-end models have. Particularly after a period of time, we have noticed that the blades seem to have more friction, making using it much more laborious. We do appreciate the shock absorbing bumpers that take some strain out. For the great price, you can’t be too picky about the performance and durability of these hedge shears. While they are by no means great, they do a good enough job that those who are on a tight budget should be content with what they get. However, product selection is severely lacking and there won’t be much here for anybody other than those with light tasks who are looking to stick to a tight budget. We aren’t overly impressed with H.B. Smith Tools hedge shears’ hedging ability. While the blade is sharp enough, it doesn’t keep a sharp point for very long. However, the passes are wide enough to meet most people’s needs, seeing how they come in 7 ½” and 8” choices. Beyond that, there isn’t much variation with blades or configurations so those who prefer the shearing ability of wavy blades or like an extra-long handle for more power will be out of luck. Being a budget-oriented company, there are some shortcuts in regards to build quality. The metals that are used are more prone to rusting and cracking than some may like. The other product come in a wooden handle that doesn’t have to deal with rusting but there have been reports of it breaking after short periods of usage. 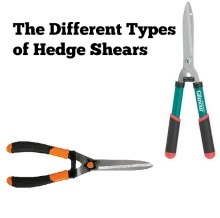 The styling of the two different hedge shears is starkly different. The wooden handle looks very conservative and plain while the metal/plastic handle example has aggressive styling and comes in a vivid yellow and black color palette. We would prefer something more in the middle of the two but this, of course, isn’t a huge issue. The biggest selling point of the H.B. 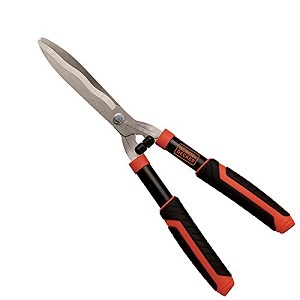 Smith Tools hedge shears is in the great asking price. These are among the most affordable hedge shears you will find. Obviously, this typically means that you won’t have a product that will last as long or perform as well as some of the competition but for those on a very tight gardening budget this may be the risk you are willing to take. Seeing how there are only two products to choose from, product selection is severely lacking. Basically, anybody who wants a smaller than average or larger than average hedge shear will be out of luck. In addition, other common wants such as serrated blades, telescoping handles, or varying handle shapes are nowhere to be seen here. This company sticks to the basics. The friction between the two blades isn’t the best, and you will definitely notice this as they are used some as friction will become even more noticeable. This can make a simple task more burdensome than you may like. However, we do like the tension adjustment dial that H.B. Smith Tools has included as well as their rubber grip handles. There isn’t really anything to get excited about here but for the great price, we can’t be too picky. Our biggest wishes are that H.B. Smith Tools would consider expanding their product lines to other sizes and types of hedge shears as well as bump up the quality some even if it ends up making the sale price go up a bit. The blades used are stainless steel bypass blades. They look great but only perform about average. We have noticed that many of the more exotic carbon alloy blades are much harder and sharper but going with something like this doesn’t seem like it would fit in with Joseph Bentley’s design approach. The blades are also a bit on the small side so for those who are looking for something that can handle a larger-scale project you may be out of luck. This company uses a lot of wood where other companies would opt for a type of metal or hard plastic. The wood is relatively tough but won’t be able to handle the level of abuse that many metals can over time. However, Joseph Bentley offers a limited lifetime warranty so we hope that they would honor this if there were any major issues with the handle over time. One of the biggest selling points of these products is their great looks. They have a classy elegance about them that you simply won’t find in any other products on the market. The wood that they use on the handles is simply gorgeous and reminds us of something that you would find on a high-end model of steak knives and not on garden equipment. That being said, it is a very Spartan look that isn’t adorned with the bells, whistles, and bright colors that most products have so if that isn’t your thing you might not enjoy the looks. These are definitely not budget products although they aren’t the most expensive in the industry. From a performance standpoint, we feel that the price is a bit high, but you are really paying for the great looks and unique design with these. Some people simply won’t care that much about how nice or ugly a particular piece of garden equipment is and would instead focus on its performance. For those people, this probably isn’t the best item to purchase. Product choices are severely limited with there being only two that we have found. And the two that are available are essentially the same thing with the same target audience. We love the look of these hedge shears and wish that Joseph Bentley would expand their product range to larger and smaller examples. A big negative in the simple approach is that many of the features we like to see in hedge shears are missing. Things such as adjustable blades, rubber bumpers, telescoping handles, grips, etc. are not here and we definitely miss that. We wish that they would try to find a way to incorporate some of these features into their products without affecting the overall look of the product because not having them makes these hedge shears much more difficult to use. There is no denying that Joseph Bentley hedge shears win the looks award. But unfortunately, they don’t quite keep up in the performance and usability department for the price. Durability is acceptable considering that they don’t use a lot of the types of materials we typically see in garden products but for the high price we would like to see more performance features and a few extra product options wouldn’t hurt, either. The blades are sharp enough but are made of less than stellar metal which means that they will lose their sharp edge very quickly and also break or chip. Another issue is that the blades are somewhat thin and can easily warp or bend while in use. The one positive is that the blades are plenty large and in some cases are some of the largest we have come across. However, this potentially becomes a bad thing when the blades are overly thin. Being a budget item, build quality isn’t the best. The handle and blade are very thin and don’t last for a very long time. Cheap plastic is used in place of metal in many areas. A big issue that has been reported by many is that the blade can literally pop out of the slot in the handle, not only making for an inoperable hedge shear but also a potentially dangerous situation. These are very bland and boring products. They not only look low-quality, but the designs don’t help the matters at all. Expect them to come I dark colors such as forest green, gray, and black and not have any sort of aesthetic pattern on them. 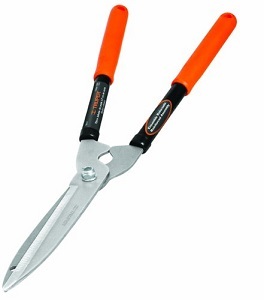 The one positive with Mintcraft hedge shears is their very competitive price. They will be among the most affordable you find, but as mentioned above and throughout the rest of this review it comes at the cost of lackluster performance and questionable build quality. One common theme we have seen with a lot of the budget lines is limited product selection. Mintcraft actually has a decent array of products to choose from. The biggest positive from this is that a couple of the products are extremely large which is something we don’t see as much as we would like. The problem is that the weak components mean that they are even more to breaking or being damaged. Again, using questionable materials and thin blades means that the blades are more likely to warp, bend, and break and this can create unwanted friction and make the user experience much more difficult. Yes, they are lightweight but we would be willing to take on some extra weight for a sturdier unit. At least they provide us with rubber grips on the handles and impact bumpers. Similar to many if not most ultra-budget models, there is simply too much sacrificed to save a few bucks. We do appreciate the more diverse product line and the attempt at larger sizes but save a few bucks extra and get a product that will work correctly and last much longer. Their sole hedge shear comes equipped with 22” of cutting width which is about average for the industry. We do like the blades that are used, seeing how they are titanium bonded. Miracle-Gro has stated that their unique titanium material means that the blades are 3x harder than untreated steel and this will help the edge stay sharper for much longer. This is a pretty well-constructed tool and should last for a long time. In fact, Miracle-Gro definitely stands behind it with a lifetime warranty. As discussed above, this is thanks to features such as the titanium-bonded blades that not only stay sharper for longer but also resist corrosion. The frame itself is also relatively thick which means that it should stand up to the typical wear and tear that garden tools experience. These are pretty plain-looking in appearance. There is a green handle with black pads and the blades are typical semi-gloss metal color. While these perform plenty well, we just feel that they don’t do a good job of conveying quality through their appearance. The handles are a bit cheesy looking and the blades are a bit on the small side (despite being perfectly acceptable at what they do). While most won’t consider looks as being a deal breaker, we do wish that Miracle-Gro would consider doing a bit of a facelift. These hedge shears are very reasonably priced. For the performance that you get and particularly the lifetime warranty that backs it, you get a product that will essentially last for life for a lot cheaper than many other products on the market that don’t offer such a warranty. Selection is obviously very limited, seeing how there is just one product. This means that if you are after a smaller or larger size or prefer a different styling of blade you are out of luck. The one product they do offer is versatile enough but we do hope that more shears are released in the future. We feel that the handle is quite ergonomic and is shaped in a way to allow for strong cuts without creating significant hand fatigue. The blades also pass by each other with relative ease. We don’t know if this is because of the titanium bonding on the blades but we are glad that Miracle-Gro found a recipe that works. In regards to weight, these weigh about normal so they won’t be the most burdensome to hold but won’t be the easiest, either. 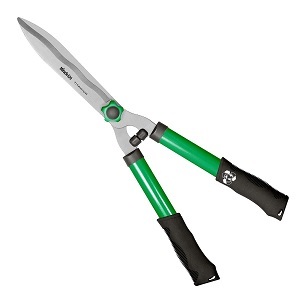 Overall we like what Miracle-Gro gives us with their sole pair of hedge shears. The build quality is more than adequate and the lifetime warranty is a huge selling point for those looking for a long-term solution. The titanium bonded blade stays sharp for a long time and should handle light to medium thickness vegetation. Our only issues are the lack of product choices and the styling could use some improvement. But the price is very reasonable and makes these minor issues easy to overlook. Thanks to the fantastic blades that Okatsune hedge shears possess, you will enjoy some of the best hedge cutting in the industry. Not only are the blades extremely sharp, but the handles are some of the longest you will find as well. This gives amazing leverage which allows for the ability to cut very thick brush with minimal effort. The blades are sharp and remain sharp thanks to being forged by the best Izumo Yasugi steel, which is traditionally used in katana swords. This particular steel has high carbon content and is forged by master blacksmiths. These are extremely tough hedges that should last for many years. As mentioned above, the blades are made of premium materials and are incredibly tough and should remain sharp for long periods of time. Beyond this, the handles, while made of wood, are also quite tough and can keep up with the typical wear and tear of garden tools despite not utilizing metal like many other products on the market. While there are other premium units on the market that take advantage of high-quality materials, we really like the love and craftsmanship that goes into each Okatsune tool. This helps to make them last much longer than a product that is quickly assembled without the careful details. The styling of these are quite simple, but we actually enjoy it. The wood handles come in a light but refreshing color and the base of the handles are in alternating red and white accents. This is a stark contrast with the dark blade but it all comes together very nicely. One thing you will quickly notice is that these blades only come in straight handles instead of curved (which is a very common shape in other products). We don’t mind this at all and feel that it helps to add to the unique styling. Okatsune makes some of the most expensive hedge shears on the market. However, this is to be expected since they utilize extremely high-quality blades and craftsmanship. While the sticker shock may overwhelm some, we look at these as investments that will outlast and outperform just about everything else for years to come. This helps to make the high initial cost of admission much easier to swallow. There are plenty of sizes for just about everyone’s needs. The variations come in both blade length as well as handle length which means that most people should find a particular tool that meets their physical requirements as well as the requirements of the task at hand. The one thing that is missing from the Okatsune lineup is wavy or serrated blade options and curved handles. These are only minor issues at best seeing how the blades perform so well as-is, meaning that you don’t really need specialized handles. From a cutting perspective, using these is like cutting a hot knife through butter. The extra sharp blades combined with the long handles means that all but the absolute thickest brush should be sliced through with relative ease. That being said, you won’t find any sort of padded or gel handles which some people prefer. There also isn’t a bumper system in between the handles that absorb impact so if you use these for long periods of time and are a particularly aggressive slicer it might bother your wrists after a while. Okatsune hedge shears are among the top of the top thanks to their great usage of Japanese steel and their close attention to detail during assembly. The result is a product that excels at handling even the thickest brush with ease. There are plenty of sizes of blades and handles to choose from as well. However, you won’t find all of the bells and whistles that some of the other premium brands offer, but we don’t feel that they are necessary here. Also, the asking price is very high but again we feel that this is more than justifiable given the great product you get to enjoy. The blades themselves aren’t bad. They are heat treated steel that is up to 5x harder than traditional untreated steel and this helps it to stay sharper for longer. This unit also comes in a wavy blade format which helps it to cut through thick vegetation in a shear motion that can make it much more efficient than a typical straight blade. There are many issues with reliability in the Scotts hedge shear. The handle is made of relatively weak aluminum and is prone to cracking and breaking much sooner than you would like. Also, the extra hard blades are somewhat of a double-edged sword in that they are somewhat easy to chip. There are replacement blades available but they come at an additional cost. Overall this is a very bland-looking product. There is little variety in regards to color outside of the subtle lime green accents. The rest of the product is essentially semi-gloss silver. In addition, the handle and blade are both on the thinner side and simply don’t give off the feeling of being high-quality. Prices are about middle of the road. However, the performance is simply lacking too much to make it a strong buy here. If it were heavily discounted it would be easier to overlook some of the issues but at its price point, there should be higher-quality materials and manufacturing being used. Product choices can’t be much worse than this. There is only a single product and it is somewhat of a niche item since it is a wavy blade. So anybody looking for a traditional straight-blade product from Scotts will be completely out of luck. This definitely cost some points in this metric. While we appreciate the attempt to include some helpful features they, for the most part, fall short. The extension handles locking mechanism is very poorly designed and constantly comes undone. In addition, the tension will have to be constantly adjusted during use and the handles are prone to slip. We are pretty disappointed in what Scotts has brought to the table in their hedge shears, particularly considering how many other lawn-related products they have that are of great quality. The build quality and performance are simply lacking here, and there are not nearly enough different products to choose from. At the price they are asking, we feel that there are much better choices out there. Performance is acceptable with these and they should be able to be your solution for most small to medium-sized projects. Their blades come in heat-treated steel with their PROSeries options coming with an additional titanium coating that will further increase wear and tear levels and also help alleviate potential rusting issues. We also like that both wavy blades as well as straight blade options are available and that Stanley even gives us a telescoping blade for those hard to reach places. Blade sizes are average to above average. Standard to most Stanley products, these come with a limited lifetime warranty. This obviously shows us that these parts are designed to last. That being said, these shears still aren’t quite as tough as some of the more expensive, premium-line models on the market. The handles themselves aren’t quite as tough and are made of lower caliber material than some of the high-end steels used in other models. The blades, however, are right up there with the best in regards to toughness. Either way, Stanley hedge shears will be more than adequate for all but the most challenging commercial or industrial applications. We really like the design that Stanley has implemented in their hedge shears. Typical to most Stanley products, these come in the attractive yellow and black layout with silver accents (including the blade itself). Beyond this, there are really visually appealing rubber grips that are molded into the handles. This really gives off a progressive look that allows these products to stand out when compared to other typical hedge shears. Cost is about the middle of the road on these. While that might be a bit out of range for people on a tight budget, most should still not have a huge issue being able to afford these. And that fact that they stand by their limited lifetime warranty means that you can trust that your dollar will go further in the case that there is a potential issue with build quality or construction. There are only three options to choose from but from a diversity standpoint, they are about as varied as you can get with such a small sample size. You have a decent range in blade size, starting with their wavy blade and going up to the 10” blade on the telescoping product. In addition, you have both popular blade configurations (wavy and straight). That being said, there aren’t any options for the extreme outliers that are looking for a very compact product or for those looking for huge industrial products so perhaps Stanley could consider catering to these people in the future. One thing Stanley excels at is making their products user-friendly, and there is no exception here. The grips they use are extremely comfortable and do a good job of keeping a grip. The handles are also curved to increase leverage and allow for a better bite. 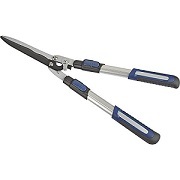 In addition, their compound action hedge shears go a step further and have an innovative design that directly increases cutting power against large shrubs. Finally, all of this force is absorbed through the included rubber bumpers. Stanley hedge shears do an acceptable job for a reasonable price. The styling is great and they are very user-friendly. There is a rather small choice of products but they are still diverse enough to meet most people’s needs. Sure, they aren’t the best in the market but we see no glaring issues with them. You have choices of both straight and wavy blades, both which have areas that they are better used for. As expected, the wavy blades will do a better job of grinding and ripping while the straight blades are more efficient and straight slices. The blades themselves are about average in length, ranging from anywhere from 7.5” to 8”. The handles are also average in length other than the telescoping model which has extremely long handles for easier reach. We liked Tabor Tool’s choice to go with forged carbon steel for their blades as this is a very hard material that should stay sharp for long periods of time. The built quality is great on all of the Tabor Tools hedge shears. The blade is very tough and has a coating that will help resist potential rusting. The frame is also quite thick and you can really put some force behind it without worrying about it cracking or breaking. For those looking for an even tougher item, you can go with their professional hedge shears that are made of solid metal from top to bottom. Styling is pretty standard, albeit there is a lot of variety from one model to the next. All but one Tabor Tools hedge shear is made of a metal or plastic base, with the last one having an attractive wood structure. They all come with red and black accents which are a nice touch. The biggest thing you will notice about these products is how impressive the handles look. Even without having a lot of fancy colors or designs on them, they give off the appearance of being high quality. We are most surprised at how relatively affordable these are despite being able to compete with many of the higher end brands on the market. You really don’t feel that Tabor Tools cut any shortcuts in regards to material and manufacturing processes, so the fact that they are much more affordable than a lot of the other comparable products on the market is a lovely surprise. The only place we can see that there may have been a reflection of the cheaper price is in the handles, as must have more plastic than metal. While it is by no means that largest selection in the industry, Tabor Tools still offers enough of a variety to satisfy most people. The one complaint that we have is that nearly all of their blades are similar-sized. Many other companies will offer up a much wider range of sizes to choose from. However, they do offer different configurations including wavy blade and straight blade. These are very easy to use and have no major issues with them. The varying blade designs mean that whatever you choose will be optimized, making tasks much easier. In addition, the extendable handles on their telescoping model mean that you don’t have to reach out as far to get the back of bushes or other foliage. Tabor Tools has also installed shock-guard bumpers that help offset some of the jarring vibrations that are common while using hedge shears. Tabor Tools hedge shears really hit the mark in just about every area. Not only do they perform more than adequate, they come in enough variations to meet most tasks (even for those looking for professional-level hedge shears). The price is also very reasonable and among the most affordable in the industry for this level of performance. Our only minor complaint is in the lack of blade sizes but seeing how there are plenty of different blade types it is not a big issue. The metal used on the blades is stainless steel but it isn’t quite as hard as a lot of the competition. Because of this, it won’t keep a point for as long as some would hope. In addition, the blade is on the shorter side which means that you will have to make more passes in order to finish up a bush or tree. Seeing how there is just the one product, you are also out of luck if you prefer the performance of a telescoping blade or a wavy blade. Similar to many budget lines, you will have to sacrifice some durability in order to meet these low price points. Plastic will be where metal is located in other more expensive models, for instance. You will also not enjoy the level of build quality and craftsmanship that more expensive products enjoy. The handles have been reported to break prematurely and the blades can also cheap much quicker than many would hope. These are very standard hedge shears that won’t stand out among the competition. The blade assembly is very straightforward and is held together by a 6 point nut. The handles come in an orange and black color scheme that honestly looks somewhat cheap on the plastic handles. The great selling point of the True Temper hedge shears is the amazing asking price. It will be among the most affordable you can find and should meet just about everyone’s budget. We would prefer you to save up longer so that you can purchase a better product but understand that some people will only be looking for budget options. In that case, it is a decent choice but still by no means the best. There is just a single product so product selection is severely lacking. By limiting to just one product, True Temper is diluting their target audience down to the level that we wouldn’t recommend. There is a demand for budget hedge shears so why not offer more choices? This is a lightweight product seeing how it utilizes plastic and thin metal. The blades actually are quite smooth and there isn’t as much friction between them as some might expect. In addition, the cushion comfort grips are very nice and hold up to wear and tear for the most part. Finally, they included the rubber bumpers we love to see that make long periods of cutting much less stressful on your joints. The True Temper hedge shear meets its goal of being extremely affordable but falls short in several other areas. Cutting performance and durability are lacking, and product selection is limited to a single example. We do like the added creature comforts, however. Performance is average at best. The shears used range from 10 inches to 12 inches in length. In regards to blade material, tubular steel is used which has an acceptable level of hardness and cutting ability. Truper themselves state that their shears are intended for trimming and shaping rather than aggressive cutting so that tells you all you need to know. We aren’t saying that they perform bad but anybody looking at tackling a larger-scale project will probably want to look at some other avenues. The major issue with these products is that they aren’t made or coated in something that can handle rust. The end result will be that over time you will have to deal with rusty blades and handles if you ever expose these products to rain or high humidity areas. While this isn’t a deal breaker, it can open up issues that can affect the life expectancy of these shears. We wish that Truper would consider lining their components in something that can offset the rust. The blades of all of their products look essentially the same despite subtle differences in length. The handles are also quite similar if it wasn’t for the differences in color between the wood structure and the rubber grips. In regards to the grips, for the shears that are equipped with them, they come in a standard red and for the example that doesn’t utilize grips it comes in the traditional wood finish. In regards to the wood handles, it is actually a very nice color that we enjoy. These are priced at a very competitive range that will be among the most affordable you will find. There obviously are some sacrifices that have to be made in order to achieve this. You won’t find quite the level of performance that you would find in premium shears nor will you have quite the life expectancy but at this price range, you can’t be too picky. And, honestly, for the price range, they don’t perform too bad. There are only three products to choose from and all of them are quite similar in size and application. The primary difference seems to be in the handles which are also eerily similar. For those looking for a powerful shear that can handle huge products and those looking for a small portable shear for simple tasks, you may be out of luck and be better off looking elsewhere. Finally, we wish that Truper would consider varying their blades to also include serrated edges. While these products work fine out of the box, the biggest issue will come after they begin to rust. This will make operation much more difficult since the friction between the blades will go up quite a bit. These products are also lacking the impact bumpers in between the two handles which we really like to see in the shears that we review. This means that every time you open and close them you will have to deal with the brunt collision of the two sides which can be exhausting after a while. Truper hedge shears don’t necessarily do a poor job but they are nothing to get excited about. While the price is very competitive, there are too many shortcuts in regards to material selection and construction to make these a huge recommendation. The biggest problem is the rust that you have to deal with. We also hope in the future that Truper considers expanding to some more diverse hedge shears as what they currently offer is much diluted. The blades that Worth Garden uses are made of alloy steel. While they aren’t the strongest or sharpest out there, they do a decent enough job for most applications. You also get to enjoy either straight or wavy blades which really opens up the applications you can use them for. We definitely prefer the larger 10” blades as they can cut through a lot more area in each pass. Build quality is average at best. 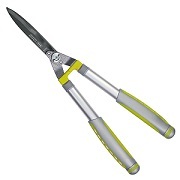 Due to their low price point, Worth Garden hedge shears utilize rather thin aluminum tube for the frame. It should hold up to most wear and tear but don’t expect it to be as durable as the steel that many of the competitors use. The blades also have a tendency to get dull a lot quicker than some would like, meaning that you will have to either replace them or try to sharpen them. 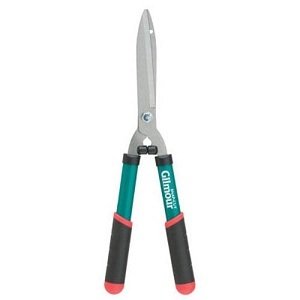 All of Worth Garden’s hedge shears look essentially the same. They come in light silver/off-white aluminum frame with green rubber handles at green accents at the top of the handle as well. In addition, the blades, despite varying quite a bit in shape and application, all resemble each other both in color and shape (minus the subtle serrations you see on the wavy blade models). We don’t mind the look but it won’t win any beauty contests. We love the great price point that these products are in. They are among the most affordable you will find and the quality and performance aren’t nearly as bad as you might expect given the price. The biggest issue will be the life expectancy but for this price, you really can’t complain. The variety of products you can choose from is vast and should meet the needs of just about everybody. Not only do you get to choose from multiple blade sizes but there are also choices in the type of blade. Worth Garden even offers telescopic hedge shears and topiary hedge shears. All of the features you want and expect are here. The fact that they use aluminum might not be the greatest from a durability standpoint, but it definitely helps to make these hedge shears very lightweight and mobile. The blade has a non-stick coating on it that helps reduce friction and make passes easier. There are also nylon buffers to help absorb some of the impact as well as adjustable blade tension. 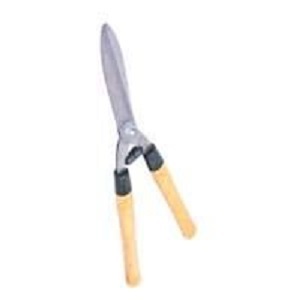 Worth Garden hedge shears take the budget-oriented route in their large selection of hedge shears. Their performance and usability are more than adequate given the price, and the issues with toughness are definitely noticeable but can be accepted for those who are only wanting to spend a small amount on their purchase. What are the Different Types of Hedge Shears? Not all hedge shears are the same. In fact, the different types are designed for their own unique applications. Becuase of this, it is important to know what the different types are beforehand. This will help you make the smartest choose for your particular needs. Straight blades are the most traditional hedge shear blade type. 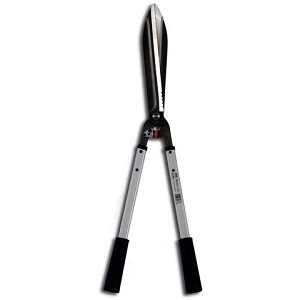 These refer to blades that have a straight edge and utilizing cutting actions similar to scissors in how they operate. 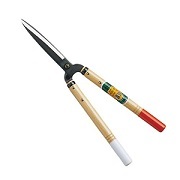 They are good for lighter foliage and leaves that don’t need much grinding action to cut through. They are also typically smoother in operation and they rely on fast swipes as opposed to powerful swipes. Wavy blades have a profile that has contours which create subtle curves in the blade. This results in more of a “biting” or “grinding” action vs. a clean sweep like you see in straight blades. This can be great for cutting through thicker vegetation such as limbs and thicker vines. A vast majority of handles are traditional. They are a set shape and length and are designed around this established length. Typically normal handles are perfectly fine for most applications and are also usually more affordable. Seeing how they have less moving parts it does mean that they can also be more durable in the long run. A telescoping handle has the ability to extend and contract via an adjustable slider. This allows for a wider range of cutting lengths and also higher torque when means the ability to have more cutting power with the same level of effort. We really like telescoping handles but they do have their own unique obstacles. They are typically a bit more expensive. Also, more moving parts means that you have to be more careful in handling them to avoid potential damage. 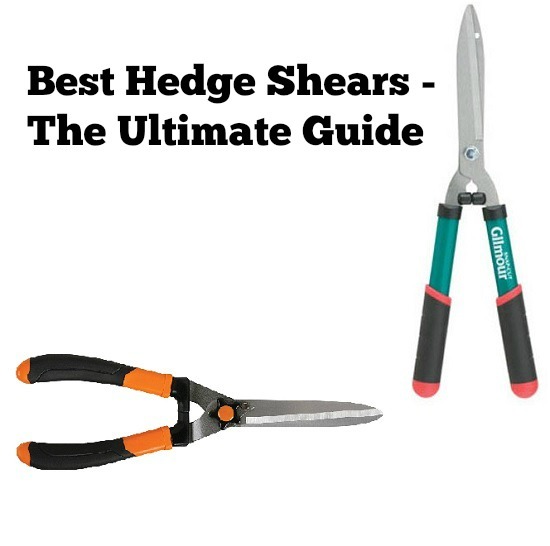 1.5 What are the Different Types of Hedge Shears?